The infrastructure facilities available at Sethu Bhaskara Agricultural College and Research Foundation is excellent. Total land of about 234 Acres available, in which students can practice any agricultural technique that they learn. This land availability on site is much more that what is required as per the the norms of Tamil Nadu Agriculture University. The Cultivable land comprises Wet Land, Dry Land, Garden Land Orchard , Botanical garden, Floriculture, Medical plants garden, Vegetable garden and Spices and Condiments are available as per TNAU specification. Percolation pond for rain water harvesting is available. Shade Net is present. Mist chamber, glass house, green house available. Well-constructed buildings to the extent of 1,28,867 Sq.ft. with good ventilation and light provides a conducive atmosphere for learning and teaching. Sprawling Play ground space is adequate as per DTCP approved site plan with stadium and indoor games facility to maintain the physical and mental fitness of the students. Computers with broadband connectivity has been set up. Lecture halls with overhead projector, suitable to accommodate students is available. Full-fledged Laboratory for each Department has been set up. Library with text books, basic journals with internet facility and photocopying machine has been set up to facilitate students to take up reference work and for advance research. Placement Cell, Admission Cell, Communication Lab and Examination Hall available. Central instrumentation facility with essential instruments (HPCL, GC, GLC, HPTLC, AAS. pH Meter, Calorimeter, pressure plate) is available. Well-equipped Audio-visual room is available. Spacious well-ventilated auditorium is available. Have Tie up with nearby Apollo Hospital at Karaikudi to take care of the medical needs of students and staff. Well-paved roads – Main Road and Feeder Roads with black top are available to facilitate smooth commutation. Meteorological Observatory “B” Class is available. Farm Machineries and Implements – Sufficient to teach the students and cultivate the lands are available. Sufficient implements are available for students to take up operations related to Horticulture, Agriculture and forestry. Animal and Live Stock – Cows, goats, piggery Unit available for utilizing for the course. 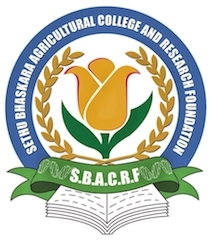 Adequate number of competent teaching staff and diligent administrative staff is a commendable aspect of SBACRF.